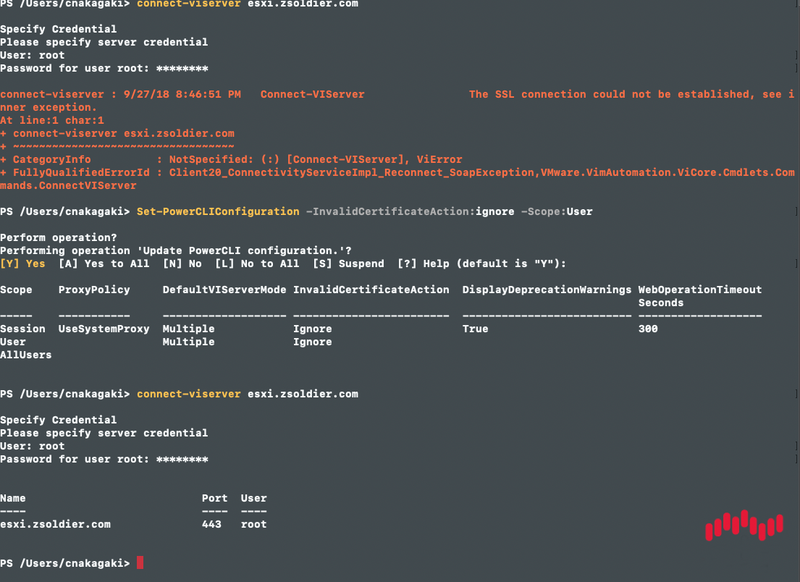 Zsoldier's Tech Blog: PowerCLI: The SSL connection could not be established, see inner exception. "The SSL connection could not be established, see inner exception." Be sure to "Set-PowerCLIConfiguration -InvalidCertificateAction:Ignore" if you plan to connect to an ESXi/vCenter that does not have trusted certificate. Interestingly, something must've changed recently because the PowerCLI module actually would output a more descriptive message about setting your PowerCLIConfiguration. This appears to be the case w/ Powershell Core 6.1. I'm actually unsure when this behavior started happening and whether is module or powershell related. Regardless, figured I'd post this since I was initially confused myself when running some things on another system. This error shouldn't show up if you download the root certificates and import them on your machine. You can download them from the root vsphere web page (link on the bottom right). Best way to get rid of this error is to download the trusted root certificates from vsphere's root web page (link on the bottom right) and import them on your operating system. Yes, that is another way as well. A way to do that in Powershell would be preferred though across all OS’s. That way it can be automated.